I can't wait to show you what I made. I love it! I knew I wanted to use this dress form from The Girls' Paperie Paper Girl set, and I had already stamped the image. It was lying on the table, and I had the lace out for another project. I threw a small piece (headed for the trash) near the dress form, and voila! - an idea was born. 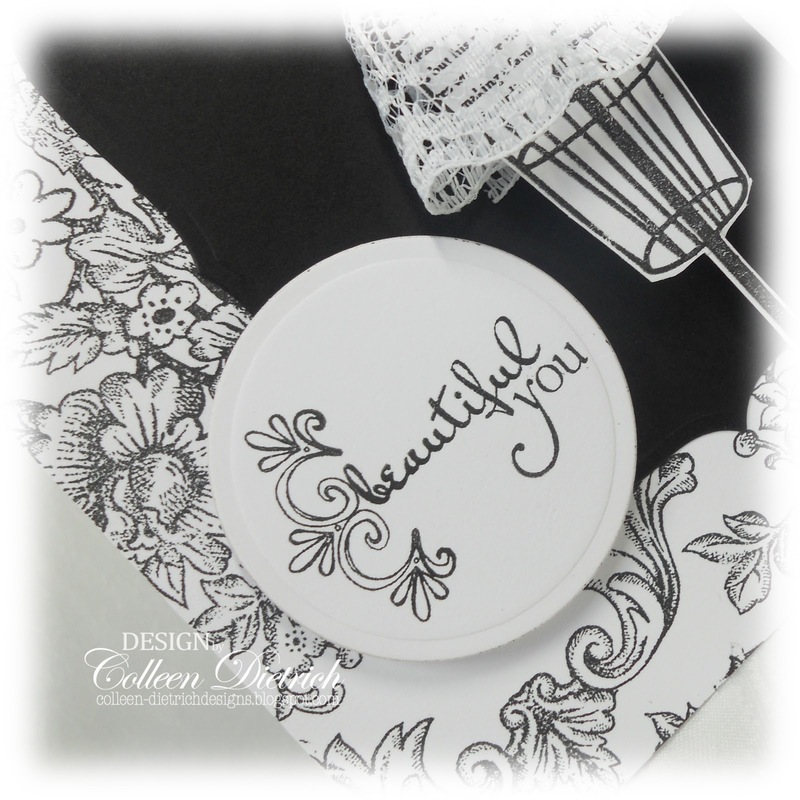 The Bella Toile background stamp from Stampin' Up! (sadly, retired) seemed a perfect fit for this ultra-girly card. The sentiment and flourish are from Verve's Celebrating You set. Our sponsor this week is the ever-popular, much-loved The Twinery! I just love the elegant love of this the perfect amount of pink!! Such a pretty card..
Love the pop of color and the skirt! This is absolutely gorgeous, Col! LOVE how you've dressed that form, and your background stamping is delish! Beautiful card, Colleen! I love the bit of lace you added-so cute. Too cute :) Lovely touches on the dress form and the flourish by the sentiment. I love it, too, Colleen! NOW I know what you meant when you wrote that we were on the same wave-length. Isn't that funny that we both made cards that were black/white + a splash of color in the past week that focused on dress forms?? I love the little lace skirt you gave yours. So frilly and fun! beautiful card...love the added bright pink...looks fabulous. Once again, you have taken a picture and turned it into a beautiful masterpiece. What a lovely card in every way. Hugz!!! That touch of pink is so perfect! Oh! I love this Colleen! The background is perfect with the dress form. 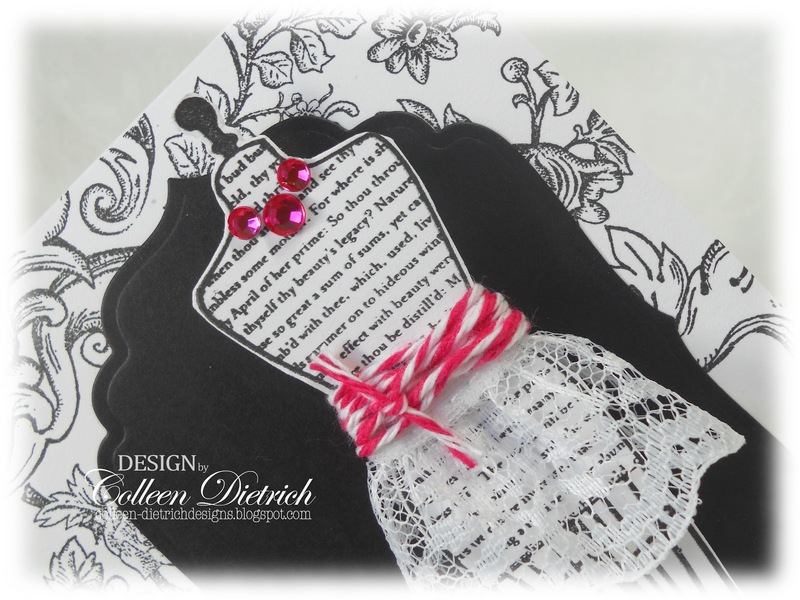 A classy, girly card! Gorgeous! I too love doing cards with just a pop of color. I really love how you added the lace to the dress form! Oh, that card is stunning! Your use of that pop of color is absolutely perfect. Lovely work! What a great way to use the lace, Colleen. And, she really knows her accessories...love the blingy necklace. Toile is one of my favorite things. Too bad it is retired. Wow! Just so lovin' this card, Colleen! Girly and so beautiful! Love how you blinged up the dress form! Perfect lovely background, too! It sure is rockin' the girly theme...love it! I love this Colleen! So elegant! The dress form with the lace is perfect! The splash of pink is fantastic too! The lace is oh so FAB! 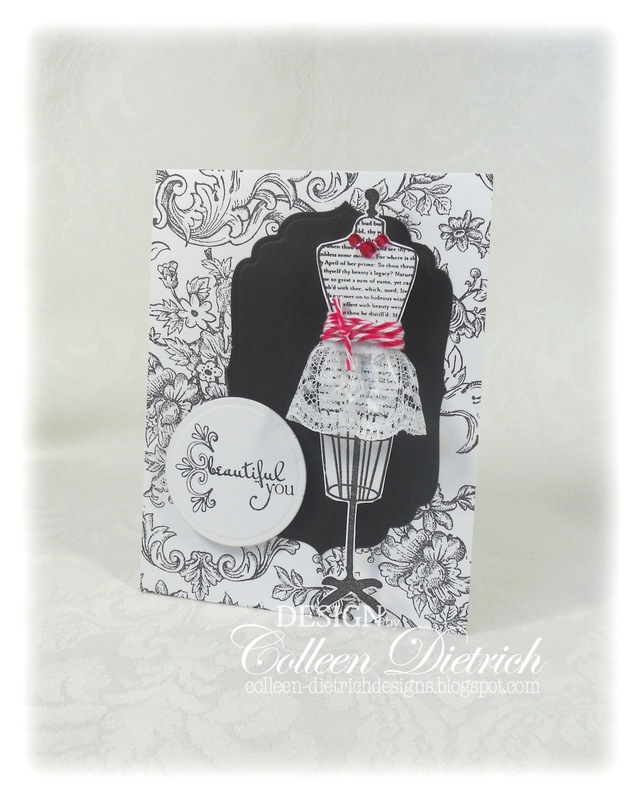 LOVE this elegant card, Colleen! Perfect amount of pink for the splash! What wonderful stamping on this card, Colleen! The black and white with the touch of pink is so eye-catching! This is certainly lovely, indeed! OOOHHHH I love this! The lace skirt with the twine! Fantastic and beyond! Love how you put this together, that's my logic for never puting anything away. Just gorgeous, love the damask background, and the beautiful dress form with the little lace skirt, just adorable!